All Things Dog Blog All Things Dog Blog: Fido's Freebie Friday Wants Your Giveaways, Contests & Freebies! What can I say; this past couple of weeks have been incredibly busy with preparations and wrap up of Super Dog Sunday™. That means I've been neglecting my freebies. 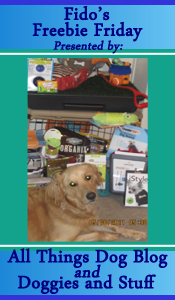 Thank goodness that Doggies and Stuff has some fun things to offer, and we both invite bloggers to link up their giveaways, contests and freebies. Do you have anything to add to our weekly offers? The good news is that all the Super Dog Sunday™ prizes shipped yesterday, so I'm finally able to move forward on other projects, postings and the much-neglected email file. As always, THANK YOU for hosting I see some cool Giveaways - I'll have to wander 'round and check them all out! Thanks for hosting the Linky! Good Luck everyone...lots of great giveaways!